Obama Hails Climate Deal "Breakthrough"
President Barack Obama said the United States, China and several other countries reached an "unprecedented breakthrough" Friday to curb greenhouse gas emissions - including a mechanism to verify compliance - after a frenzied day of diplomacy at the U.N. climate talks. The deal reiterates a goal that eight leading industrialized nations set earlier this year on long-term emission cuts and provides a mechanism to help poor countries prepare for climate change, the official said. But it falls far short of committing any nation to emissions reductions beyond a general acknowledgment that the effort should contain global temperatures along the lines agreed to by the leading economic nations in July. A European Union news conference to announce the EU reaction was postponed and an official said an overall agreement involving those nations not included in the deal that Mr. Obama announced was still being negotiated. Mr. Obama suggested that Friday's agreement among the five countries would be adopted by the larger summit in its closing hours. "I am leaving before the final vote," he said. "We feel confident we are moving in the direction of a final accord." 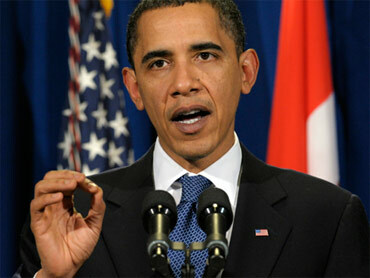 If the countries had waited to reach a full, binding agreement, "then we wouldn't make any progress," Mr. Obama said. In that case, he said, "there might be such frustration and cynicism that rather than taking one step forward we ended up taking two steps back." Mr. Obama spent the final scheduled day of the climate talks meeting with world leaders, including Chinese Premier Wen Jiabao, in a bid to salvage the global warming accord amid deep divisions between rich and poor nations. In announcing the five-nation deal, Mr. Obama said getting a legally binding treaty "is going to be very hard, and it's going to take some time." The deal as described by Mr. Obama reflects some progress helping poor nations cope with climate change and getting China to disclose its actions to address the warming problem. "It's not what we expected," Brazilian Ambassador Sergio Barbosa Serra said. "It may still be a way of salvaging something and paving the way for another a meeting or series of meetings next year." Mr. Obama had planned to spend only about nine hours in Copenhagen as the summit wrapped up. But, as an agreement appeared within reach, he extended his stay by more than six hours to attend a series of meetings aimed at brokering a deal. New Zealand's climate change ambassador Adrian Macey called it "a modest deal." "I see Kyoto as a first step," Macey said. "This another first step, a global first step." More than anything, Macey found the United Nations process on climate change "appalling." "We are ready to get this done today but there has to be movement on all sides to recognize that is better for us to act rather than talk," Mr. Obama had said in an address to the conference, insisting on a transparent way to monitor each nation's pledges to cut emissions. With the climate talks in disarray, Mr. Obama and Wen met twice Friday - once privately and once with other world leaders present - in hopes of sweeping aside some of the disputes that have barred a final deal. Tempers flared as Mr. Obama prepared for the second meeting with the Chinese, reports CBS News correspondent Sheila MacVicar from Copenhagen. There was a scuffle over media access - a diplomatic courtesy. "These two powers, very wary of each other, are each desperate not to have a deal here that will give strategic and economic advantage to the other," New York Times columnist Thomas Friedman told "Early Show" co-anchor Harry Smith Friday. However, officials said the two leaders took a step forward in their talk and directed negotiators to keep working, but the degree of progress was not immediately clear. Later Friday, Mr. Obama and Secretary of State Hillary Rodham Clinton held talks with European leaders, including British Prime Minister Gordon Brown, French President Nicolas Sarkozy and German Chancellor Angela Merkel. Reporters asked how negotiations were going as Obama walked into the meeting. "Always hopeful," he replied. Many delegates had been looking toward China and the U.S. - the world's two largest carbon polluters - to deepen their pledges to cut their emissions. But that was not to be. Mr. Obama may eventually become known as "the man who killed Copenhagen," said Greenpeace U.S. Executive Director Phil Radford.